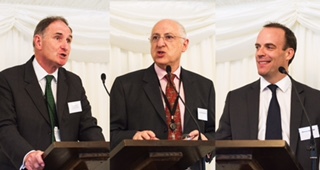 Last night we held a celebratory event to mark the Law Commission’s 50th anniversary. 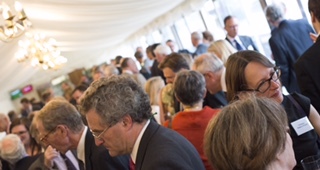 More than 180 guests, including former Law Commissioners and Law Commission staff, stakeholders and friends of the Commission, joined us in Parliament’s elegant Terrace Pavilion to help celebrate the achievements of 50 years of law reform. Welcoming guests to the reception, Lord Carlile remarked on the role played by the Law Commission in continuing to present Parliament with well thought-out legislation, adding that Parliament was “absolutely the right place” to celebrate 50 years of the Law Commission. As well as marking the achievements of 50 years of law reform, the event was an opportunity for us to thank the friends and stakeholders who have supported the Commission over its long history. Chairman, Sir David Lloyd Jones, recorded the Commission’s achievements: over 200 law reform reports, of which around two-thirds have been implemented, 220 consolidating Acts and 20 Statute Law Repeals Bills, repealing over 3,000 obsolete statutes. These achievements, he said, have been possible only because of the expertise and dedication of the Commission’s lawyers and its staff, and because of the support we have received from our friends, in particular those in Parliament, and our stakeholders. We are grateful to everyone who attended and helped to make the event such a special and memorable occasion. We are grateful, too, to The Legal Education Foundation who so generously sponsored the evening. This short, three-minute video illustrates some of the ways in which the Law Commission’s law reforms have brought benefits to individuals and organisations, and to society, over the past 50 years.